With a particularly spectacular outward nine, a strong finish and recurring views of the architectural wonder that is the Burj Khalifa, Dubai’s newest course is poised to become an irresistible lure for locals and tourists alike. Alister MacKenzie departed this life 84 years ago, long before Dubai discovered golf and longer still before Dubai Hills Golf Club began taking shape on the drawing board at Berkshire-based European Golf Design. But if he could, the revered British architect surely would doff his Tam o’ Shanter to this utterly impressive addition to the emirate’s concentration of world-class golf. With the majestic Burj Khalifa serving as an almost constant companion, Dubai Hills G.C. will open next month with not one but a compilation of memorable holes designed to deliver gratification to the masses. 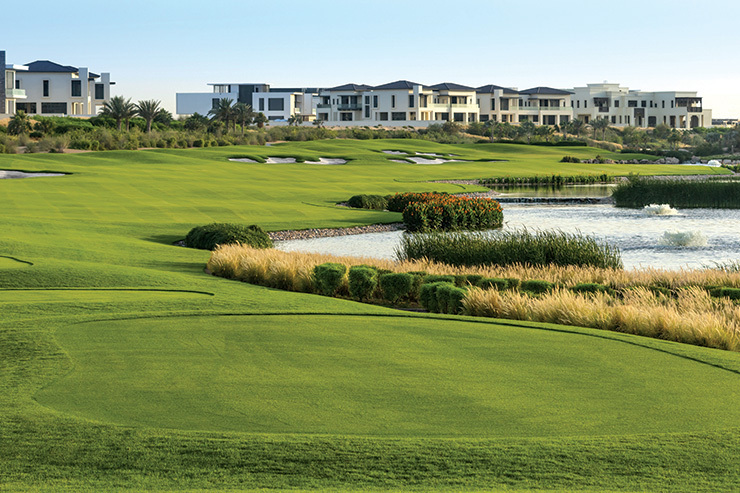 Prepare to be wowed by an outward nine that somehow manages to get better and better and a finish set to produce the type of theatre Dubai Creek’s 17th and 18th holes are famed for. Many a friendly match will come to a watery crescendo here. In between, there is never a hint of strategic staleness or aesthetic repetition. Dubai Hills G.C. isn’t one of those must-play courses where a handful of holes and an iconic backdrop disguise what is really a slog to be endured rather than enjoyed. Instead, it is eminently playable by offering generous landing areas off the tee and approaches that demand more in craft than they do to brute force. The stunning 8th is a par 5 that keeps coming at you. It’s one course-fits-all accomplishment for which designer Gary Johnston deserves genuine acclaim. Indeed, Johnson has delivered on his brief in spades, producing a layout that will set aflutter the hearts of regular birdie markers while keeping more modest ball strikers interested with its open fairways and welcoming approaches. Club members will become comfortable with shots played from all manner of rumpled lies while the gigantic green complexes ask for creativity with wedge and putter in hand without requiring the touch of a tour pro, a prerequisite to enjoyment on courses nearby. There are ample places to donate a wayward Pro V1 or two, including six man-made lakes. It’s a course that will lull you into a false sense of security if you’re not careful as the aforementioned closing holes did to the author. Thankfully Dubai Hills G.C. 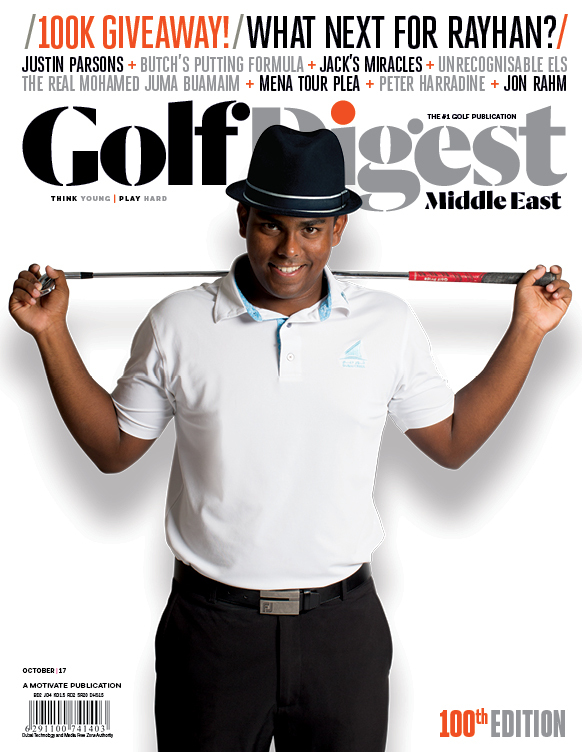 has a solution if you are “stimulated” to seek remedial work on your game in the form of a contemporary Golf Academy. MacKenzie would approve. The greens and villas at Dubai Hills Estate are impressively proportioned. First impressions count and Dubai Hills G.C. does its grand entrance well. Already mature roadside landscaping greets visitors as they indicate off Al Khail Road at exit 65 (Al Marabea’ St, East) and weave their way towards the clubhouse at the leading edge of a rapidly expanding development. The 45,000sq foot, Arabian-themed clubhouse and carpark surrounds were taking final shape when Golf Digest Middle East played in June but the playing surfaces were already in top condition, including a big practice putting green beside the first tee that is so cleverly positioned you to wonder why other clubs haven’t thought of it. Dubai Hills’ 1st hole is what all good opening holes should be, a relatively gentle start without being a complete pushover. It’s 396 yards from the black tee tips (all measures herewith are from the championship tees) but like every hole at Dubai Hills G.C. offers four other options with the par 4 just 252 yards from the forward-most green tees. A gentle fade will get you underway without calamity and leave the ideal look into the putting surface. It also promises your first uneven fairway lie, a clever and deliberate outer perimeter defence to the course’s generously proportioned greens. Given most of the Paspalum Platinum grassed surfaces can be reached with mid to short irons (providing, of course, you selected the starting blocks on the 1st that match your ability rather than your ego), it’s a subtle way to keep things interesting. Things ramp up on the 2nd where you play across a shallow ravine to a par 3 where a bunker presented at right angles to the tee protects 80 per cent of the wide, undulating green. You have the first real strategic decision to make on the tee of the following par 4 where a deep desert baranac splits the fairway in two and offers a brilliant risk-reward conundrum. The bigger hitter will be tempted to fire right and directly at the green; it is just drivable but promises scorecard tears if you miss high right or deep left into the craggy fairway divide. The more prudent play is to position your drive out to the plateaued fairway on the left, leaving little more than a flick with a wedge over the aforementioned baranac to a green that will see its share of three-putts even if you do reach in regulation. The 6th is a driveable par 4 and definite birdie chance. By now you are getting a feel for Johnston’s strategy where a short approach on one hole gives way to a longer test of accuracy on the next. 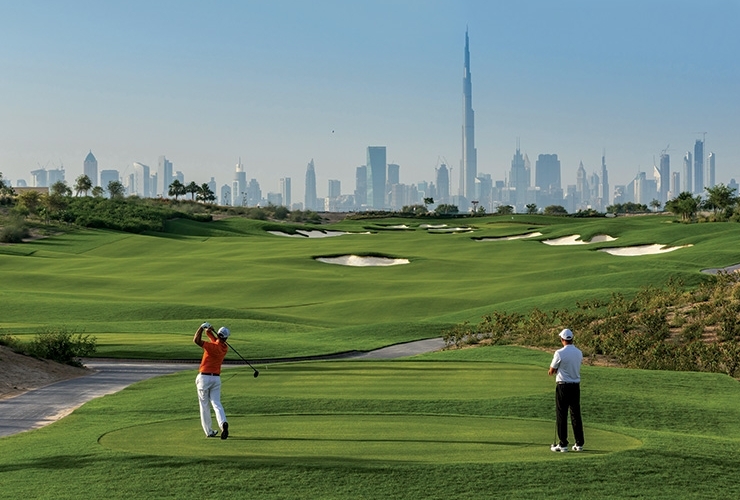 Enjoyment levels ratchet up accordingly, especially when you swing around to the left for the first par 5 (see p36) and are encapsulated with those hero shots of the Burj Khalifa. The world’s tallest building seems an awful long way in the distance but the 5th hole, at 540 yards, will tease big hitters to have a pop in two. The more strategic option is to lay up short of the right hand fairway bunker with your second shot to avoid a fiddly little shot from the tightly clipped swale that guards the green, along with a smattering of the 83 bunkers that shine bright around the layout with their crushed marble imported from Oman. Designers don’t do signature holes (they lavish equal amounts of attention on every hole) but Johnston is rightly chuffed with how the 6th turned out. 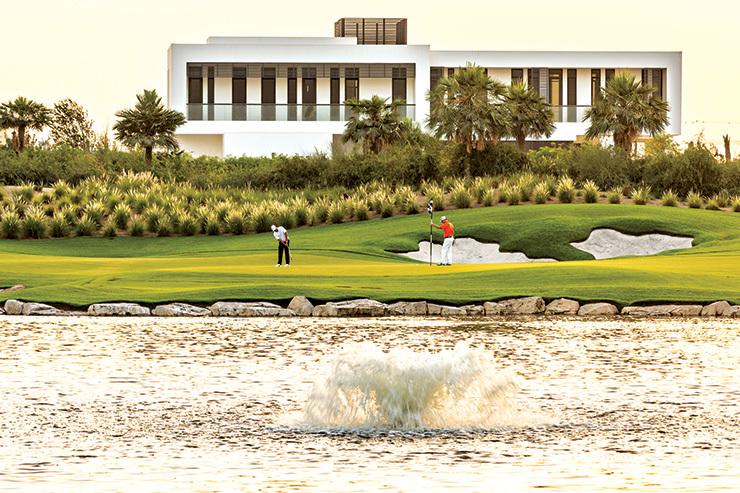 It’s a drivable par four – every good course should have at least one – played slightly uphill to a backdrop of villas. With a gaggle of four fairway bunkers and curvy contouring around the green, this is a dreamy hole (main image p40) and could result in back-to-back birdies if you’re striking it sweetly. You’ll take par at the uphill 7th and run, and do so even more gleefully on the 8th which features the course’s first water hazard hugging almost the entire right hand side of the gently dog-legging par 5. There are actually seven tee areas on this 604-yard behemoth, a hole that just keeps coming at you and is best approached from the left for obvious reasons. Mind you, any bailout will leave a potentially slippery, downhill chip back towards the water; take in the boulder work while you’re over there plucking your ball out of the water – the impressive, hand painted shotcrete work around the partial island-style green was done by Imagineering, the team behind the waterfall on Earth’s 18th hole at Jumeirah Golf Estates. Just when you thought the outward nine couldn’t possibly get any better, water awaits on the par 3 9th along with a horseshoe of teeing options. A bailout area to the right of the green will see plenty of action, especially from those tempting fate from the 220 yard tips. The 9th, 220 yards from the tips, is the most picturesque of Dubai Hills’ memorable par 3s. 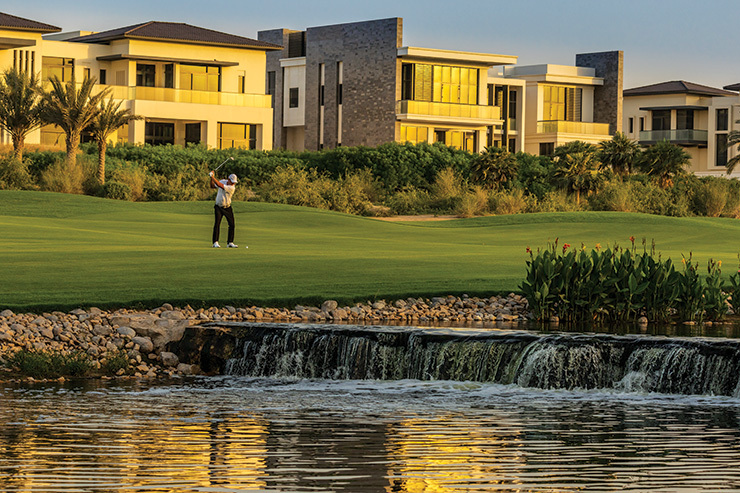 Dubai Hills G.C.’s homeward nine doesn’t quite measure up to the heights of its outward companion but perhaps that’s because the front nine was constructed nearly three years ago, not to mention that it is truly outstanding. 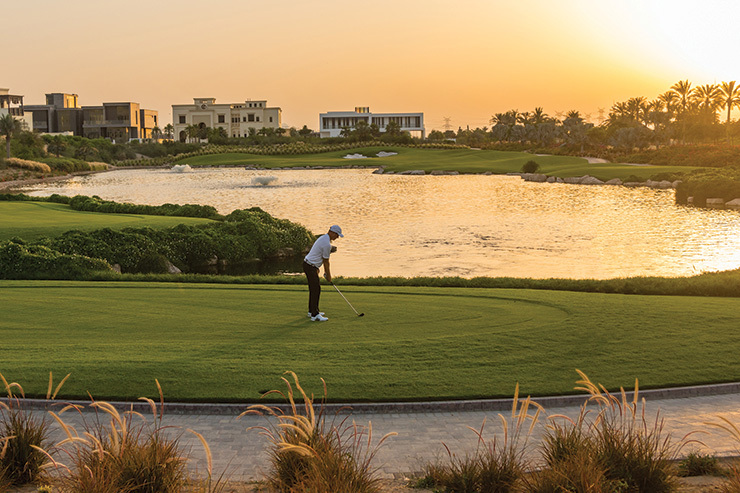 The back nine, more desert links, will mature once the trees grow and barren horizon on several holes is granted definition by more of the gargantuan villas that populate the established parts of the 119-hectare property. It’s not that there aren’t any holes MacKenzie wouldn’t enthuse over. The 13th affords views of the Burj Khalifa from the tee and has undertones of Arabian Ranches’ 13th hole thanks to a lone Ghaf tree that stands guard to the left hand side of this par-3, while the 16th is another fun par-4 with a split fairway. You could easily be lulled into a false sense of security on the back nine as the author was until he stepped upon the 17th tee and duly sent two uncooperative spheres for a swim. Played into the prevailing wind, the 203-yard par 3 shares a lake with the previous hole and its watery, right-sided defence will be a magnet to all but the purest of strikes – or massive bailouts left that will serve only to bring the water back into play again. Indeed, walk off with a three-four finish at Dubai Hills G.C. and you’ll likely be at or very near the summit of any monthly medal leaderboard because like its predecessor, the closing par 4 is an absolute brute. Dubai Hills G.C. wanted to differentiate its finale from the par-5s that predominate the UAE golfscape and Johnston has achieved this by conjuring up a 485-yard finish that demands a solid drive and an equally crisp approach into a peninsula green. There’s magnetic bunkering front right that looks like it’s cut tight to the green but is actually a clever optical illusion. That and water right are set to provide plenty of entertainment for those watching on from the impressive clubhouse terraces. Any par here will be richly applauded. No two lies are ever the same at Dubai Hills G.C. thanks to its rumpled fairways. 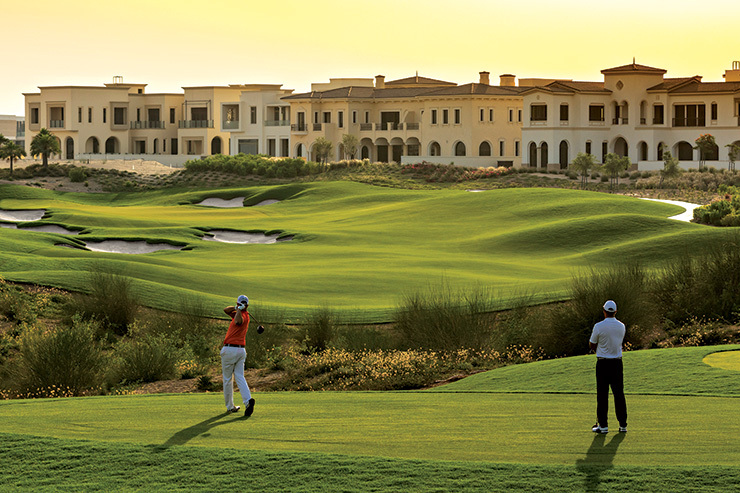 Exceptional golf is the norm rather than the exception in the UAE and Dubai Hills G.C. doesn’t let the side down. Johnston might not be a household name but the 39-year-old is already highly regarded among his peers. It comes as no surprise that the stunning Montgomerie Maxx Royal, a layout carved out of the forest in Antalya and home to the European Tour’s Turkish Airlines Open, is among his designs, nor that he was commissioned to upgrade famed Prince’s Golf Club in Sandwich, a regular Open Championship qualifying venue. Coincidentally, ground has just broken on European Golf Design’s next Dubai project near the new Al Maktoum International Airport. Johnston says ‘Emaar South’ will be more in the style of Arabian Ranches Golf Club and if the Scotsman’s Middle East debut is any indication, we can’t wait to play it. Dubai Hills G.C. isn’t as challenging as Earth at JGE or Yas Links in Abu Dhabi but then it never intended to be. This is a members course that strikes just the right balance between challenge and playability. Shots of the so-called signature holes back-dropped by the Burj Khalifa are guaranteed to go global and wow even expats spoiled by so much great golf, perhaps sufficiently so to have some reconsidering their memberships elsewhere across the emirate. Golf is meant to be fun and Dubai Hills G.C. serves that up for scratch markers and those more accustomed to scratching it around. MacKenzie would definitely approve.